Glutathione S-transferase (GST) is a family of enzymes that play an important role in detoxification of xenobiotics. GST catalyzes the formation of the thiol group of glutathione to electrophilic xenobiotics. It utilizes glutathione to scavenge potentially toxic compounds including those produced as a result of oxidative stress and is part of the defense mechanism against the mutagenic, carcinogenic and toxic effects of such compounds. 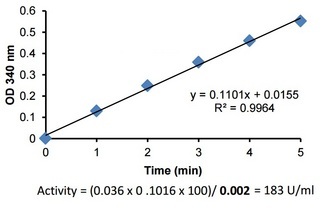 The GST Colorimetric Activity Assay Kit is based upon the GST-catalyzed reaction between GSH and the GST substrate, CDNB (1-chloro-2,4-dinitrobenzene, which has the broadest range of isozyme detectability (e.g., alpha-, mu-, pi-, and other GST isoforms). Under certain conditions, the interaction between glutathione and CDNB is totally dependent on the presence of active GST. The GST-catalyzed formation of GS-DNB produces a dinitrophenyl thioether which can be detected by spectrophotometer at 340 nm. One unit of GST activity is defined as the amount of enzyme producing 1 µmol of GS-DNB conjugate/min under the conditions of the assay. The kit can detect GST activity in crude cell lysate or purified protein fraction, and also quantitate GST-tagged fusion protein. 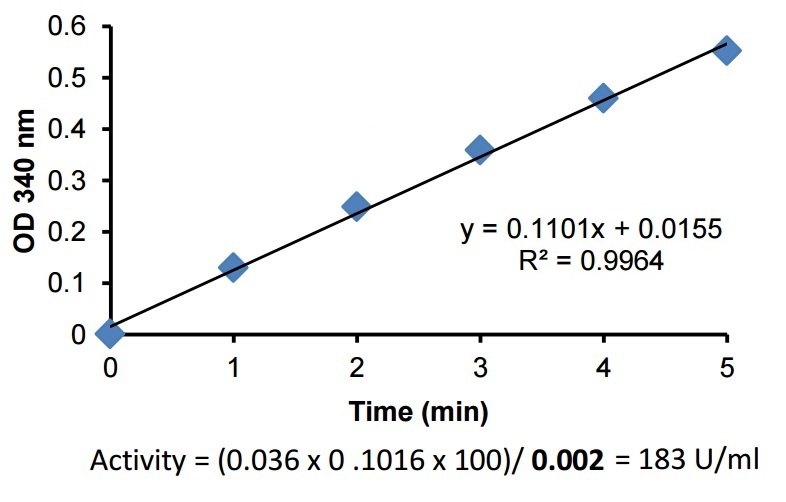 This assay measures Glutathione S-transferase (GST) activity in crude cell lysate or purified protein fraction, and also quantitate GST-tagged fusion protein. Measurement of GST sample activity.